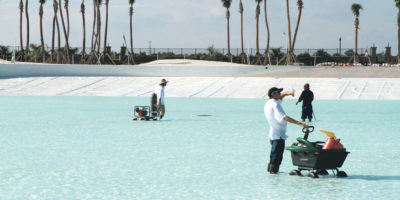 Beachwalk celebrated a major milestone in July when developer John Kinsey emptied the last gallon of water into the new community’s 14-acre crystal-clear lagoon. 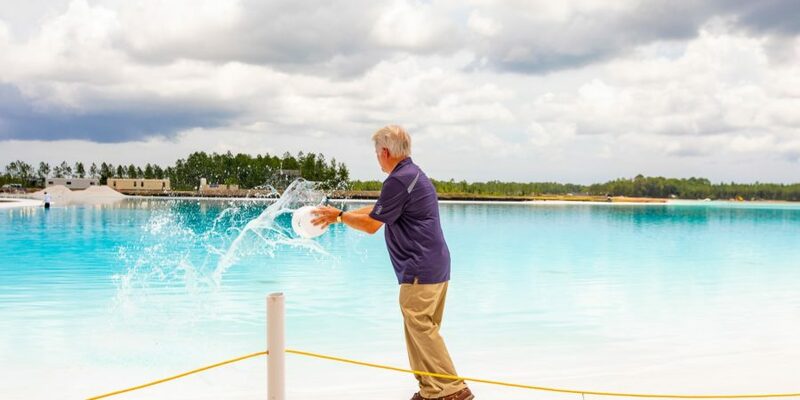 The lagoon, a Crystal Lagoons® amenity, contains 37 million gallons of water and serves as the anchor for Beachwalk, bringing a little bit of the Caribbean to Northeast Florida. Set against a white lining, the lagoon has taken on the natural turquoise hue that will deepen to a “Caribbean” blue. The sparkling waters are surrounded by a 100-foot white-sand beach with wavy palms and winding footpaths. 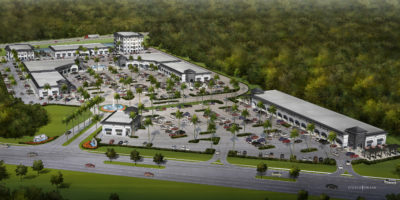 Beachwalk is part of the New Twin Creeks Planned Unit Development, a designated 3,000-acre Development of Regional Impact on both sides of County Road 210 across U.S. 1 from the western border of Nocatee. Kinsey’s group has owned the site for 13 years. The community features a Caribbean, Key West and West Indies style — metal-roof homes, Bermuda grass, and every type of palm tree that will grow well in North Florida. In addition to the lagoon, Beachwalk will feature water slides, a miniature golf course and a 2,500 square-foot splash park for dogs. A planned clubhouse has been styled after one seen at a multi-billion-dollar Caribbean beach and golf resort. Residents will be able to swim, paddle kayaks, or stroll along a boardwalk. Beachwalk will have nearly 800 homes at build-out. Construction at Beachwalk includes single-family homes and twin villas on the lagoon by homebuilders Americrest Luxury Homes, Lennar and Vintage Estate Homes. The developer is investing $35 million to widen County Road 210 from two to six lanes and provided two school sites to the St. Johns County School District. Of Beachwalk’s 1,200 acres, 500 are set aside for preserve. Photo courtesy James Brown, Jr.
Beachwalk developer John Kinsey adds final gallon to Beachwalk lagoon.